Co-written by a professor and 10 students, this book explores their attempts to come to grips with fundamental issues related to writing narrative accounts purporting to represent aspects of people's lives. The fundamental project, around which their explorations in writing textual accounts turned, derived from the editor's initial ethnographic question: "Tell me about the [previous] class we did together?" This proved to be a particularly rich exercise, bringing into the arena all of the problems related to choice of data, analysis of data, the structure of the account, the stance of the author, tense, and case, the adequacy of the account, and more. As participants shared versions of their accounts and struggled to analyze the wealth of data they had accumulated in the previous classes -- the products of in-class practice of observation and interview -- they became aware of the ephemeral nature of narrative accounts. Reality, as written in textual form, cannot capture the immense depth, breadth, and complexity of an actual lived experience and can only be an incomplete representation that derives from the interpretive imagination of the author. The final chapter results from a number of discussions during which each contributing author briefly revisited the text and -- through dialogue with others and/or the editor -- identified the elements that would provide an overall framework that represents "the big message" of the book. In this way, the contributors attempted to provide a conceptual context that would indicate ways in which their private experiences could be seen to be relevant to the broader public arenas in which education and research is engaged. In its entirety, the book presents an interpretive study of teaching and learning. It provides a multi-voiced account that reveals how problematic, turning-point experiences in a university class are perceived, organized, constructed, and given meaning by a group of interacting individuals. Contents: Preface. Reinterpreting Teaching. E. Stringer, Teaching Community Based Ethnography. K. Henry, Community Building in Small Groups. L. Christensen, Philosophical and Pedagogical Development: An Ethnographic Process. 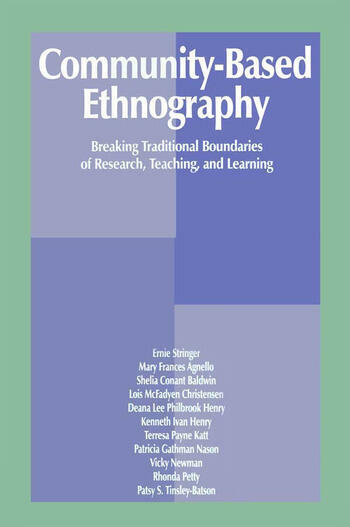 R. Petty, Everything is Different Now: Surviving Ethnographic Research. P. Nason, The Impact of Group Interactions on Meaning Making: Learning Qualitative Research Methodology. M.F. Agnello, An Illuminative Account of Personal/Professional Conflict: Loss, Redefinition and Re-Emergence of Self in the Process of Ethnographic Research. D.P. Henry, Reaching Consensus and Writing Collaborative Accounts. V. Newman, Community Ethnography: Reproduction and Resistance in Writing the Collaborative Text. S.C. Baldwin, High School Students' Participation in Action Research: An Ongoing Learning Process. P. Tinsley-Batson, Models for Services/Distributor Relationships. T.P. Katt, A Learning Journey (In Progress): A Personal Biographical Ethnography. E. Stringer, Teaching Re-Interpreted. Appendix: Syllabus: Qualitative Research for Educators.